Three years ago JR, whose real name is Jean Rene, gave the pyramid a very different treatment, covering it in a giant trompe-l'oeil that made it look as if it had disappeared. A camera on the roof of the Louvre fed images to two giant screens. JR, who has been dubbed the "French Banksy" after the British street artist, is famous for blowing up photographs -- often of people -- into huge collages that have graced the wall between Jerusalem and the West Bank and the Rio favelas, among other sites. The artist promised that his latest work -- created using a technique that distorts the image of the subject unless viewed from a specific angle -- would reveal "the Secret of the Great Pyramid." "There are more than 2,000 strips to paste on the ground, each ten metres long, so it's a huge puzzle. And when you're on the puzzle you don't see what you're doing," the artist told AFP. "It's great. We're like children watching this pyramid grow before our eyes." 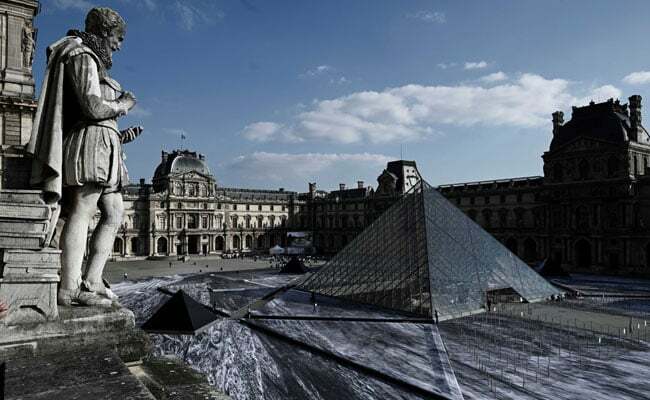 Hated by many Parisians when it was unveiled 30 years ago on Friday, Chinese-American architect I. M. Pei's creation has wormed its way into their hearts and is now revered like one of the Louvre's greatest treasures, such as the "Mona Lisa" and the "Venus de Milo".